Think you know how to make a perfect cardboard bale? Then take this quiz! 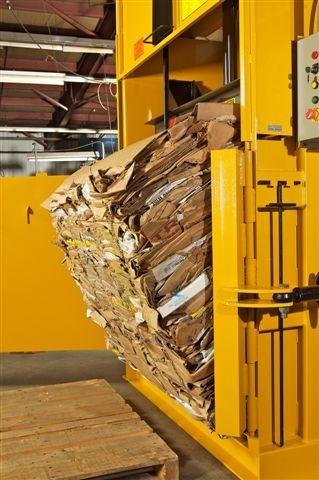 Everyone knows that quality vertical cardboard balers, like those manufactured by Harmony Enterprises, produce consistent bales of cardboard that create additional revenue for businesses. But, operational error can lead to equipment malfunction and a poor quality bale. It also creates unnecessary safety concerns in the workplace. 1. What is the first step you should take in making a perfect cardboard bale? a. Create a flat surface on the bottom of the baler with folded sheets of cardboard. b. Break down each box separately, and stand them up vertically in the baler chamber. c. Make a layer on the bottom of the chamber with other recyclables, like aluminum, for strength. 2. How should you fill the baler chamber? a. Put in one box at a time, and lower the platen after each box. b. Offload your cardboard into one side of the baler, and lower platen when the chamber is full. c. With the top (loading) door open, manually place boxes evenly across the width of the baler, and lower platen when the chamber is full. 3. How do you know when to tie the bale off? a. You should tie the bale when you are tired of loading the machine. b. Tie the bale when the chamber looks to be about ½ full. c. Tie the bale when the level of cardboard reaches full, as indicated by a bale full light, or by lining up the arrows on the platen with the arrows inside the chamber. 4. When tying the bale, what is the proper procedure? a. With the platen in the down position, turn the baler off. Open both doors, and jam baling wire or twine with your fingers through the top channels of the bale and loop it around the back and through the bottom of the bale to tie it off. b. With the top door open, place flat pieces of cardboard on the top of the bale. Run the platen to the lowest position and turn the baler off. With the top and bottom doors open, use the clean out rod to remove loose debris from the wire channels. Then, insert the baling wire in each channel from the bottom of the bale through the back, up around to the top, and then tie it off securely. c. With the platen up and the baler off, open both doors. Run the wire from the bottom baler channels through the back, up around the back of the tall bale, and tie it off. 5. How should you eject a bale? a. Standing in front of the bale, grab the bale with hooks or your hands and pull it toward you. b. From the back of the baler, reach through the channels with a rod and push the bale out of the chamber. c. With a pallet placed on the ground directly in front of the baler, stand to the side of the baler and use a strap or chain eject system to eject the bale safely onto a pallet for removal with a pallet jack or forklift. Watch this quick video that shows you exactly how to create the perfect cardboard bale! Harmony Enterprises is the innovative global manufacturer of balers and compactors for the waste handling and recycling industry. We enjoy providing solutions for our customers, but genuinely care that they understand the operational processes required both for safety and for optimizing their waste handling and recycling efforts. To see all of our balers, compactors, beverage extraction, or full product destruction equipment, please call us at 800-658-2320, or Contact Us, today!